£6 each or two for £10. High quality china mugs produced in partnership with renowned manufacturers McLaggan Smith Mugs. A ceramic version is also available. This year sees our first design batch, successful sales will lead to future designs possibly including the school badge or child led designs. This year’s mugs reflect the quality design from our school website and incorporates the key words from our school badge. On sale or to order at the International Evening on Thursday 1st December, and from then onwards from the school office. Please visit our twitter for more images. 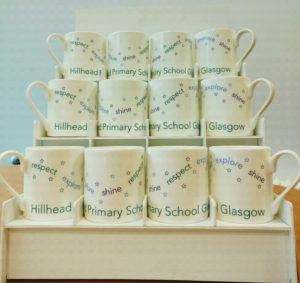 Remember – a Hillhead School mug is not just for Christmas, but can be used for Diwali, Eid, Chinese New Year, Hanukkah and life. Or just for tea and coffee!